For Kathy Kendrix, co-founder and principal of Kendrix Enterprises, the most important lesson she learned in becoming an effective entrepreneur is finding the right balance between work on the business while working in the business. Under the umbrella company Kendrix Enterprises, Kathy and husband William operate The Empowerment Group and Nia Water Sales and Service. Kathy runs The Empowerment Group, a full-service event management and consulting firm that offers a speaker’s bureau, meeting planning and consulting, publicity and media relations. The Empowerment Group produced its first independent event Soul Quest Empowerment Conference for Women in 2005 and expanded services to include Soul Quest Empowerment Speakers and Programs. William, a retiree from the Portland Fire Bureau, operates Nia Water Sales and Service, which provides beverage catering for large and small events. The namesake of the company is Nia Water fresh mountain spring water, bottled in Forest Grove, Oregon. “Nia comes from the fifth principal of Kwanzaa meaning ‘purpose,” says Kathy. Kwanzaa is known as the African-American cultural holiday which links African traditions with American traditions. Kathy’s venture into entrepreneurship “came from wanting to be independent,” she says. Before taking the plunge into launching her own business, she worked in a corporate environment for a number of years. “I worked at a local TV station as a production coordinator, and then started project managing events for my job and at my church. My husband was the one who said, ‘Kathy, you could do this as a business,’” she says. Cultural competency is an important aspect of Kathy’s approach to business. “When mainstream businesses hire me, it’s usually because they want to effectively market to ethnic groups. They have well-meaning intentions, and my role is to advise them on what they need if they want to conduct successful marketing campaigns,” she says. Nia Water also draws heavily on the Kendrix’s cultural roots. “We wanted to focus on a principle of Kwanzaa, and came up with the tagline ‘Quench Your Soul with Nia Water.’ We tested it out at an event, to see how people would react. People who are familiar with Kwanzaa recognized it right away. I had several people tell me that they kept the bottle after drinking the water, because they liked the way it looks,” she says. Through The Empowerment Group, Kathy is broadening her event management services to include a Speaker’s Bureau, featuring professional speakers from diverse cultural backgrounds and industries, with specialties in a wide array of topics. “Our mission is providing personal transformation and professional growth for attendees,” she says. Thus far, Kathy has recruited about 12 speakers to participate in The Empowerment Group. 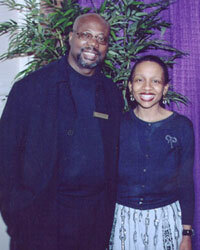 Kathy is especially proud of successfully executing the 2005 Soul Quest Empowerment Conference for Women. “After years of doing events for other people, I wanted to do an event on my own,” she says. Kathy drew her inspiration to host the event from a “life-changing” Oprah Winfrey workshop that she attended in Seattle. Kathy says she’d like to put together similar events in the future, and is currently focused on growing Kendrix Enterprises. “I want our business to prosper, and to do this, we have to think outside the box. We’re a small business, but we still have to think big. In business, you can’t count on things to stay the same,” she says. Have a passion for what you’re doing. Don’t compromise your vision for your company. Surround yourself with people that have the same goals. Avoid people that try to drag you down. In pricing, there’s a big difference between negotiation and being “talked down.” Know what you’re worth, and always stand up for your business. Never say a fast yes. Think before making a commitment. Make sure you make time for yourself. If you can’t fill your own cup, you can’t fill anybody else’s.